An archive of past NAGTNews messages is available to members at http://nagt.org/nagt/news/nagtnews.html. View online supplements for In the Trenches at http://nagt.org/nagt/publications/trenches/index.html. How long have you been involved with NAGT, and how has being a part of the NAGT community influenced you as an educator? David McConnell: I have no idea how long I have been a member of NAGT, it has been many years since I joined and it is certainly a bit different now than it was then. To me, the biggest benefit of being part of NAGT is the opportunity to interact with so many people with common interests in geoscience education. Early on, going to presentations in NAGT-sponsored sessions at professional meetings sparked my interest into looking more closely at the science behind teaching and learning. NAGT-sponsored workshops helped me gain skills and learn more about geoscience education research. JGE, the Association's journal, provided a forum to publish our research results. All of these opportunities helped me make a turn in my career from someone who defined himself as a structural geologist to someone who thinks of himself primarily as a geoscience educator. What is one of your favorite things about teaching? DM: First, as someone who was the first person in my family to go to college, I love working in public institutions where I have always taught large intro classes filled with freshmen. Beyond teaching them geoscience, I want to create a welcoming space for those first-time students and help them get off to a good start in university. So, we talk quite a lot about learning and how it happens and, hopefully, give them some skills that they can apply in the rest of their courses. Another one of my favorite things is the creativity that comes with the job. I love the opportunity to design a lesson, to think about the examples, to find great visuals, to generate activities that will help assess learning. Putting that all together, it is a bit of an art form. We all bring different things to it and make different choices and it is fun to play with the ideas. Lastly, after mentoring a fantastic group of graduate students, I have to say that one my very favorite things is interacting with these young education researchers and watching them discussing their research findings at meetings. It is a privilege to have the opportunity to provide them with an environment to explore their ideas and to help guide them along their own paths toward fulfilling careers. To read David's full response-as well as learn what he's most excited about for the future of NAGT, his favorite place on Earth, and more- read the full interview. Now is the time to renew your membership for 2019! We encourage you to renew now so that you receive uninterrupted membership benefits in 2019. 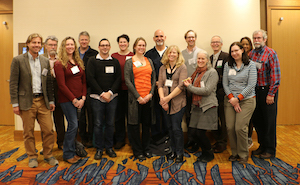 NAGT is deeply thankful for everyone whose commitment to geoscience education leads them to become a member and support the work of the Association. Now is the time to start thinking about renewing your membership for 2019, which you can do easily here. Remember that you can sign-up for automatic renewals or multi-year memberships if you want to easily continue receiving membership benefits without worrying about letting them lapse. Please also consider an added donation this year--NAGT programs and activities are more innovative, far-reaching, and effective because of your support! What makes NAGT? The answer is simple: our valued members. Whether you're interested in promoting Earth literacy, keen on joining a community of peers, passionate about teaching the sciences, or eager to learn about new teaching tools and resources, NAGT has so much to offer. Need a reminder of the great benefits of being an NAGT member? Check out the Member Benefits web page. In addition to renewals, NAGT is always delighted to welcome new members. Do you have friends or colleagues who might be interested in joining? Be sure to share information about the wonderful benefits all NAGT members receive, including discounts, innovative teaching resources, and being part of a strong community. You can also share the Journal of Geoscience Education's most popular article collection for a limited time - see the news item below for more details. Please consider supporting NAGT's activities and programming with an end-of-year contribution. NAGT is a membership-based organization and additional funds make possible the numerous scholarships, award-winning resources, and professional development opportunities the association offers. Even if you have signed up for automatic renewal of a multiple-year membership, you can still make a tax deductible donation to NAGT. To learn more about the many scholarships and programs you can support, visit the NAGT Donations Page. Thank you to those who have already donated! The InTeGrate project runs an approximately bi-weekly webinar series during the academic year. These webinars focus on topics related to using InTeGrate materials or conducting programming to forward the main InTeGrate themes. In Winter/Spring 2019, the focus will be on supporting new users of the materials, promoting learning about Earth for diverse audiences, incorporating InTeGrate themes in K-12 teacher preparation, teaching sustainability across the curriculum, and building strong courses, departments, and programs. Leading an InTeGrate webinar offers presenters the unique opportunity to promote teaching materials and pedagogies, prominently share resources and ideas with peers, and increase involvement in InTeGrate's growing community of educators. Leading a webinar is also an excellent way to create an online-accessible, professional-quality resource related to your teaching practice that you can easily add to your portfolio or share as a representation of your pedagogy and/or work. Also, the InTeGrate project welcomes ideas for new webinars in Winter/Spring 2019, but space is limited, so don't delay if you have a webinar idea you wish to propose. Please use this form to share your suggestions for InTeGrate webinars. You may propose a topic, suggest a presenter, or express your interest in leading a webinar. Interested in reading this year's collection of the most read JGE articles? We've put together the free access collection for Journal of Geoscience Education. All articles in the collection are free to access via the collection page until the end of June 2019. Please do feel free to share with your society members and any other contacts who may be interested. Check out the free collection here. NAGT is proud to sponsor programs and activities that align with the association's mission to support a diverse, inclusive, and thriving community of educators and education researchers to improve teaching and learning about the Earth. The first newly sponsored project is EDDIE: Earth and Ecosystems, a scale-up of the previously NAGT sponsored Project EDDIE. The goal of the project is to promote teaching quantitative skills needed to work with large environmental data sets in geology, hydrology, ecology and environmental science courses through the development of curricular modules built on a model tested in the previous project. The project also features a webinar series, described below. The newly NAGT-sponsored EDDIE: Earth and Ecosystems project is offering a series of webinars that focus on using large environmental data sets to engage students in scientific inquiry and strengthen their quantitative skills. The first webinar is on January 15, and will provide an introduction to the project, including experiences and outcomes from past and ongoing EDDIE projects, the supportive community of educators, building teaching modules, implementing modules, and evaluating student learning associated with EDDIE materials. Read more about the project and check out upcoming events, including their first webinar of 2019, on January 15. The Undergraduate Field Experiences Research Network (UFERN) is pleased to announce a new webinar series focused on 21st century field education. The webinar series will bring expertise to our discussions and thinking that support the goal of UFERN by moving field learning experiences into the 21st century. For additional information about upcoming webinars or to register for the email list, visit http://ufern.net/. Recordings from previous webinars are also provided. This workshop will focus on supporting the success of all students, including addressing the diversity of your program's student body, evaluating and strengthening your program design, and incorporating inclusive and equitable teaching practices. Based on changing demographics, we can no longer rely on the same methods of attracting and nurturing students, as there will be fewer of the demographic groups the sciences have traditionally drawn from. Additionally, our science and society need diverse geoscientists, and our professional ethics demand equitable educational opportunities for all. Earth and environmental science programs need to appeal to a more diverse population to remain a thriving and relevant community poised to meet the needs of our society. This workshop is designed to bring together faculty who teach in the Earth and environmental sciences to explore best practices for strengthening diversity, equity, and inclusion in their courses and programs. It emphasizes understanding your current students and community, recognizing barriers to and opportunities for inclusion, developing strategies to support all students, helping them thrive in their education, and launching them onto the next phase of their life or career. The workshop offers best practices in attracting, engaging, and supporting students, and under-represented minorities (URMs) in particular, in diverse educational settings. Workshop sessions will involve activities focused on strategic analysis and planning, program design and instructional strategies coupled with opportunities to learn about relevant research and experience. Participants will assess where they and their programs are now, and plan actions to be implemented on immediate to longer-term timescales. See the workshop website for more information and visit the the workshop overview web page to read more about the format, expectations, application process, and selection criteria of this workshop. Applications for the workshop are due Monday, January 28. NAGT recognizes outstanding teaching assistants in geoscience education with up to 30 awards annually. Both undergraduate and graduate teaching assistants are eligible for the award. Award winners receive a one year membership to NAGT, which includes an online subscription to the Journal of Geoscience Education and our In The Trenches quarterly magazine. The yearly membership starts January 1st of the upcoming year. The undergraduate student awards are the gift of Thomas Hendrix, Grand Valley State University. Tom was the recipient of the 1994 Neil Miner award and he also served as President of NAGT as editor of the Journal of Geoscience Education. The graduate student awards are funded by NAGT. Make a nomination using this online form by December 15. The NAGT Traveling Workshops Program (TWP) brings national leaders in geoscience education to your campus or regional event. Designed for departments, institutions, or groups of institutions with shared interests, TWP offers workshops on strengthening cross-campus environmental and sustainability programs as well as supporting the success of all students. AGI is accepting applications for 2019 Earth Science Teaching Award, given in honor of Dr. Edward C. Roy, Jr., a strong and dedicated supporter of Earth science education. This annual award is presented to one teacher of grades K-8 in the united States or Key Stages 1-3 in the United Kingdom and recognizes leadership and innovation in Earth Science education. Watch this free, two-minute webcast for an overview of the competition. Applications for this award are due electronically by January 18, 2019. See the website for more details. AGI had its first Call for 2019 Nominations at the Member Society Council meeting in Salt Lake City. AGI is looking to expand its pool of candidates for AGI officers and awards for the 2019 nominations cycle. The strength of the Federation is dependent on having participation from Member Societies in the form of nominations from within their membership to serve on AGI's Executive Committee or receive AGI awards. More information about submitting nominations for officers and awards prior to the February 1, 2019 deadline is available here. The American Association of Petroleum Geologists (AAPG) Foundation Teacher of the Year award is part of AAPG Foundation's Excellence in Teaching Awards program. The TOTY award is funded and given annually by the AAPG Foundation to a deserving K-12 Earth science teacher within the United States who has demonstrated outstanding leadership in the field of geoscience education. The award includes a commemorative plaque, an expense paid trip to the next AAPG Annual Convention & Exhibition in San Antonio, and a $6,000 monetary award. The deadline for this application cycle is Feb. 1, 2019. Each year, NAGT makes several $750 awards to undergraduate students to facilitate their study of field geoscience. These awards, previously given to students who attend a traditional summer field camp, are now available for students attending field-based courses at any time of year. The intent of the awards is to support students' participation in intensive field courses in any aspect of geoscience (including geophysics, soil science, hydrology, etc.) that focuses on students practicing skills of field observation, data collection, analysis and synthesis. Awardees are selected based on the importance of the field experience in meeting their educational and career goals, the quality of the field aspects of the course, and the importance of the financial award in allowing them to participate in the program. In addition, the committee endeavors to select awardees that expand the diversity of people studying geosciences in the field and a collaboration with the Association for Women Geoscientists (AWG) funds two additional awards specifically for women. Save the Date for the 2019 Eastern Section Meeting in Martinsburg, West Virginia, hosted by Blue Ridge Community and Technical College on Thursday to Saturday, June 6-8 2019. Submit your stories, experiences, experiments, photos, awards, etc. to the editor sukismaglik@gmail.com any time prior to each deadline. Do you have good news related to your geoscience education work that you would like to share with your NAGT Community? Would you like to call attention to a paper, presentation, or resource you developed or helped develop to share with your fellow Earth educators? Submit to NAGT's Community Kudos! Learn more about the position as well as instructions for how to apply. The Dept. of Geological Sciences at East Carolina University invites applications for two fixed-term faculty positions: (1) A two-year position teaching geomorphology, organizing/co-teaching an existing field course, and overseeing TAs teaching intro-level physical geology labs; and (2) A one-year position teaching intro-level courses (physical geology, oceanography, environmental geology) and overseeing online (distance education) oceanography labs. Both positions will be filled at the level of either Teaching Instructor or Teaching Assistant Professor, depending on qualifications. Applicants interested in both positions must apply separately for each. The Hal Marcus College of Science and Engineering (HMCSE) at the University of West Florida (UWF) in Pensacola, Florida, invites applications for three full-time 12-month positions in STEM education. Positions include (1) Curriculum Specialist, (2) STEM Academic Support Specialist, and (3) STEM Coaching Specialist. The Department of Geological Sciences at the University of Florida (geology.ufl.edu) invites applications for a Lecturer in Geosciences. This is a full-time, nine-month, non-tenure-accruing faculty position as Lecturer with an anticipated start date of August 16, 2019. The Department of Geosciences at Boise State University invites applications for a permanent full-time Lectureship to begin summer, 2019. Our geoscience lecturers are responsible for delivery of critical lower-division courses (including labs) in geology, geography, and earth system science, and development and delivery of geosciences courses of broad interdisciplinary interest to the greater university community. The Concord Consortium (https://concord.org), a nonprofit research and development organization dedicated to transforming STEM education through technology, is looking for a Research Assistant or Research Associate, depending upon qualifications of the applicant. The applicant is expected to be either a geoscientist with geoscience education experience, or specialized in science education with strong geoscience expertise. The Department of Earth Science at Utah Valley University (UVU) invites applications for a tenure-track assistant professor position in geology, to begin August 2019. In our broad search of talented candidates, we seek a committed educator with expertise in geoscience education, a proven record of effective pedagogy, and a passion for teaching lower-division Earth science courses. Tufts University invites applications for a full-time lecturer in the Department of Earth and Ocean Sciences to begin September 1, 2019. This position is for a 1-year initial contract with possibility of continued renewal of multiyear contracts, and it is included in the union for full-time lecturers (Service Employees International Union). Need help getting the word out about your position opening, event, or field trip? Submit your posting to the new NAGT Career Hub! Are you looking for new specimens for your collection? Do you have extra samples to share with colleagues? Post in the Rock and Mineral Exchange.